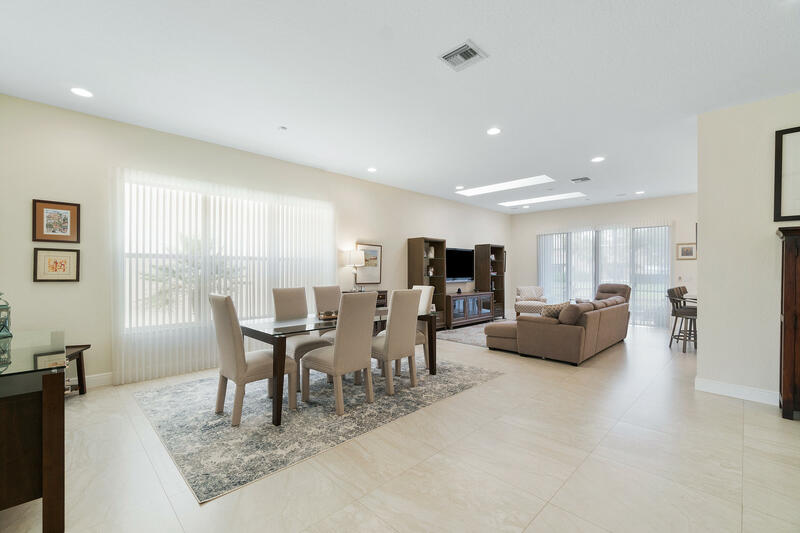 STUNNING 4/3 ONE STORY HOME IS SUPER LIGHT, BRIGHT & AIRY WITH SOARING CEILINGS & IS COMPLETELY REMODELED W/ WALLS REMOVED FOR TODAYS OPEN CONCEPT LIFESTYLE! FLOORING IS 30 X 30 RECTIFIED PORCELAIN THRU OUT & BRAZILIAN CHERRY HARDWOOD IN BEDROOMS! CHEFS DREAM KITCHEN WITH WHITE 42 WOOD CABINETS WITH PULL OUT DRAWERS, QUARTZ COUNTER TOPS, GE STAINLESS APPLIANCES, DOUBLE OVEN & MARBLE BACKSPLASH! ALL 3 BATHROOMS UPDATED! GORGEOUS LAKE VIEWS FROM FAMILY ROOM, CAFE & MASTER! CUSTOM FITTED CLOSETS! 3 WAY SPLIT FLOOR PLAN W/ SKYLIGHTS FOR NATURAL LIGHT! CUSTOM WINDOW TREATMENTS & ACCORDION HURRICANE SHUTTERS! ENJOY THE LAKE VIEWS OR GRILL OUT ON THE SCREENED & NEWLY TILED LANAI! FABULOUS CLUBHOUSE WITH RESORT POOL, TOT LOT & PLAY ROOM , FITNESS CENTER, BASKETBALL, TENNIS, GATED SECURITY!